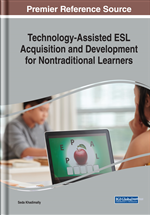 The chapter explores and describes the use of flipping the classroom approach in a Kazakhstani university language class. Flipping the classroom means that students gain first exposure to new material outside of class, depending on the preferred learning style it happens via reading or lecture videos, and then use class time to do the harder work of assimilating that knowledge, perhaps through problem solving, discussion, or debates. The idea that lies behind this approach is not new. However, the access to these reading and writing materials using digital technology is relatively new. The research question of this study was, How does flipping the classroom work in the language classroom? In law schools, for example, the approach was a traditional way of teaching in which students prepared ahead of time to participate in Socratic seminars. A number of educational books ask why digital technology is not used in the classroom or used but not much (Christensen et al., 2008; Moe & Chubb, 2009; Hess, 2010). These authors discuss the challenges that educators face today in traditional classrooms and present the benefits of the hybrid method, i.e., a combination of face-to-face instruction and online learning that can be introduced today in the classroom. The benefits of these approaches are especially important to consider as the educational community strives to shift from teacher centeredness to student-centered approach. The main idea of the student-centered approach is to provide the learning environment the way the students can gain a lot. These changes happen because different students learn differently. There is no the best way or the only way that would work best for all people. That is why teachers should be more learner-oriented so that all students can benefit from the classes they attend. To do so teachers have to address a variety of learning styles when planning their classes. Learning style is a way or method people use to perceive information. According to Giles et al. (2003), the term “learning style” refers to the special way of how new information is processed by learners. The idea to present lectures online allows ensuring in practice if the hybrid approach is applicable in the language classroom teaching process and if students gain from it while taking the course. The university where the research was conducted is not an exception and language department instructors try to put learner-centered approach into practice. However, the reality shows that it is only an assumption that teaching has been shifted from teacher-centered to the student-centered classroom. When flipping approach was first tried out in the language classroom it became clear that even though it was thought that teachers had moved to students centered approach they still were conducting traditional classes where the instructor dominated. Despite the changes that were introduced in teaching practices teachers continued giving instructions, telling students what to do and how to do, during Academic English writing classes where the research was conducted, teachers used to read lectures and the focus of those classes usually was on the teacher, not students. The students practiced at home and worked alone without teacher’s assistance in many cases. Even in the case when students were to choose the topic for an essay, in many cases, the teacher had already listed the topics and the only thing that was left to do was to choose from the list.